The Goleta Valley is blessed with having a first-rate hospital in its midst. Here is some history about how it got here, how it managed to stay here and what the future holds. In 1963, as the Goleta Valley burgeoned with new tract homes, a group of local leaders saw the need for a community-based hospital. Two years later the Valley Hospital opened its doors. It flourished for many years, with a first-class birth center, cardiac care and an ever-busy emergency room, along with other vital services. In 1984, it was chosen as an official Olympic Hospital for the rowing events held at Lake Casitas. In the early 1990s, however, it ran into financially hard times. It faced competition for out-patient services with some local for-profit surgical centers and the number of cardiac patients was greatly reduced when the Marion Hospital in Santa Maria established its own cardiac unit. There no longer were sufficient patients to maintain the skills of the cardiac operating room staff and so these services were transferred to Cottage Hospital downtown. In 1996, the hospital merged with Cottage Health Systems (CHS) and was renamed Goleta Valley Cottage Hospital. The proposed design for the new Goleta Valley Cottage Hospital. Another setback followed when state law required that acute care hospitals either had to be retrofitted by 2008 to high earthquake safety standards or else be completely rebuilt by 2013. This was to ensure that in the event of a major quake, hospitals would remain standing to care for the victims. 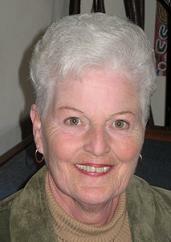 In 2002, as CHS assessed the situation, the possibility was broached that Goleta Valley would cease to provide acute care services. This would mean that it would not have to be renovated to meet the new, strict earthquake standards. The Emergency Room would remain, along with a long term care facility that had recently been moved there. All surgical services would go downtown, leaving Goleta without a hospital in the full meaning of the word. Many Goletans felt strongly about the potential loss of their “community hospital”. A “Committee to Save Goleta Valley Hospital” was quickly organized and included former and current hospital employees together with community members. Two nurses who had both worked at Goleta Valley for many years, Ann Kwarcinski and Patty Charest, emerged as spokespersons for the group. They appeared before the fledgling Goleta City Council and met with the 2nd and 3rd District County Supervisors. They were instrumental in bringing about a community meeting sponsored by the City of Goleta, the two County Supervisors and Cottage Health Systems Administration. The result was a standing room-only crowd in the Goleta Valley Junior High auditorium. This sent a message that Goletans were passionately committed to keeping their hospital. Today the picture is much brighter. Instead of losing money, Goleta Valley now makes a profit – $3.7 million last year according to Diane Wisby, the hospital’s Chief Administrator. CHS, in reassessing the possibility of closure, brought a new Center for Wound Management with hyperbaric oxygen treatments to Goleta. It also added to the site a lithotriptor, a kidney stone crusher. With the closure of St. Francis Hospital, some specialist surgeons relocated to Goleta and it is now an important center for oral and maxillofacial surgery, bringing patients from beyond the county area. Out-patient surgeries have now also increased. In addition the hospital has initiated some efficiencies such as flex time staffing, based on daily need. The hospital is now financially secure. Plans are now underway for a completely new hospital, to be built in the parking area south of the existing building. The Goleta City Council approved a needed height variance in 2006 and recently the Design Review Board approved the architectural design of the building. It will have two stories, with surgery and emergency services on the ground floor and in-patient care on the second. The site on which the new hospital will be built. There will be some changes in services. Once Cottage Hospital’s major downtown renovation is completed, the birth center in Goleta will close and its services will move to Santa Barbara. As with the cardiac program mentioned earlier, the number of births must be at a higher level than Goleta has seen in recent years in order to maintain the skills of the obstetrical staff. In addition, Cottage Hospital in Santa Barbara has the ability to take care of problem births through its excellent neonatal center. 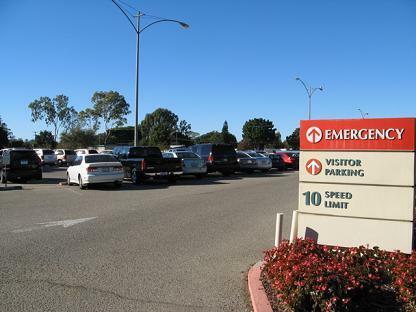 While Goleta Valley has a very active emergency room, in part because of its closeness to UCSB, major trauma cases will be directed downtown to Cottage Hospital’s Level II Trauma Center. Less severe cases will remain at Goleta Valley. The hospital runs community education programs and recently ran several drive through flu clinics, where people could get their shots without getting out of their cars. The hospital also joined community efforts for a safe Halloween, setting up a disaster tent at UCSB, staffed by Doctors without Borders. The new building will cost around $103 million. Wisby expects ground breaking to begin in 2009 with completion in 3-4 years. It will be paid for from three sources: the CHS debt loan fund, Goleta Valley’s operating surplus and last, but certainly not least, a community fund raising campaign. This is when the real test of Goleta’s commitment to its community hospital will be made. During the campaign to save the hospital, there was a yellow bumper sticker: “Goleta Valley Hospital – Use It or Lose It.” That is still good advice. And when the fundraising campaign begins, send along a check, and consider it an investment in the future good health of you and your family. When: December 15 and 16, 1-4 p.m. When: Wednesday, December 19, 10 a.m-1 p.m.